Being a holiday decorating enthusiast living in a small apartment can be a tragic affair. But, it doesn’t have to be! Here are some ways to fill your apartment with holiday spirit in space-saving, super cute ways. Don’t have enough floor space for a Christmas tree? Make one on your wall using garland and twinkling lights. It will serve as an adequate alternative to a tree in small apartments. Check out these ideas to create your own alternative tree. 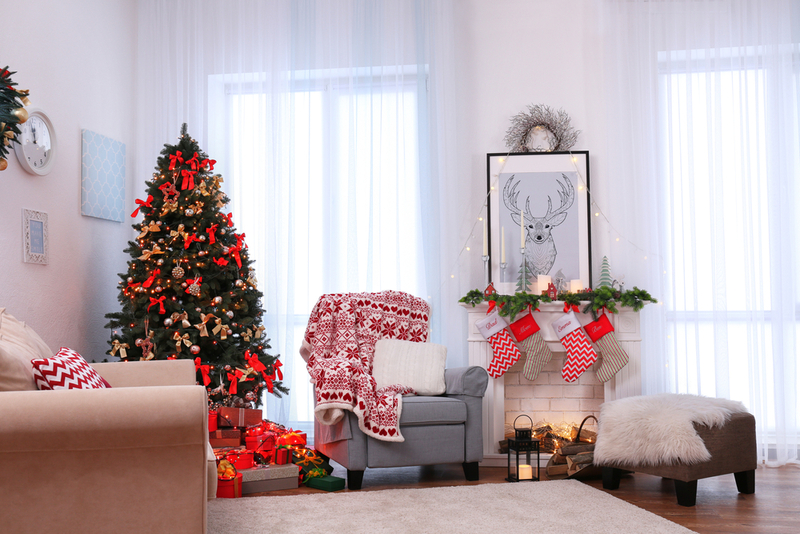 Exchange your regular living room throw blanket and pillows for ones with holiday colors and themes. Pile on the holiday scents. For instance, you can light gingerbread and cranberry scented candles. Or you can follow this recipe to DIY Christmas potpourri. Don’t underestimate the mantle space. It serves little purpose and is a great way to centralize your Christmas decorations. For a start, try a garland with lights and stockings for you and your roommates. Exchange your regular dining table runner and place settings with holiday servers and centerpieces. Follow this link for easy DIY Christmas table centerpiece ideas. Hang garland with lights around each bedroom doorway. This doesn’t take up much space but immediately makes the apartment feel like the holidays at home. Use tiny Christmas trees to decorate shelves or coffee tables. Plus, you can find them easily at stores craft and hobby stores. Exchange your kitchen and bathroom hand towels with holiday themed ones. In addition, you can switch out your hand soaps for festively scented alternatives. Don’t forget your front door! Find a great Christmas wreath or follow this link for steps to make your own holiday door wreath. Change your outdoor welcome mat to something holiday themed. Hang traditional ball ornaments from your ceiling. These ornaments are pretty light and can safely hang from fishing line push-pinned to the ceiling. Just make sure you hang them high enough so people don’t run into them. Spice up your coffee bar with holiday options. For example, you can try peppermint creamer, hot chocolate, marshmallows and candy-cane stirrers. These tasty homemade holiday coffee creamers would even make excellent gifts! Last but not least — Mistletoe! These easy ideas will turn your apartment into a Winter Wonderland in no time. Now, all we need are some Christmas music classics and a little snow.